With its Merlot Cherry finish and expertly appointed details, Oxmoor makes a most impressive statement. Each item in the collection is a finely tuned balance of design and function. The eye is quick to notice the solid wood, fluted polasters and the elegant madrone burl accents. Functional details are equally important with strategically located grommets for efficient cable management, easily accessible fully extending drawers, and pull-out writing boards that conveniently expand work surfaces. Traditional Styling - An exceptionally executed traditional style is achieved with beautifully appointed details such as madrone burl accents, fluted clipped corners, picture frame mouldings and elegantly etched glass doors. Desk tops stand in the spotlight with their design of straight grain cherry veneer surrounding madrone burl veneer set off by walnut borders with a UV topcoat. Construction - Construction throughout Oxmoor consists of wood, wood veneers and select wood product, including solid wood bases, mouldings and pilasters. Cases feature mortise and tenon construction with solid cleats, glue, screws, staples and threaded inserts with bolts. Drawers are constructed with solid wood sides and backs with veneer and veneer banded fronts and three-ply bottoms. Drawer interiors are sealed. All drawers feature dovetail construction and are suspended on fully extending, metal, ball-bearing slides. Function - All drawers are suspended on fully extending, metal, ball-bearing slides allowing easy access to the entire drawer. Box drawers have a 75lb. load bearing rating. File drawers have a 150lb. load bearing rating. File drawers are equipped with metal rods for side-to-side letter or front-to-back legal hanging files. 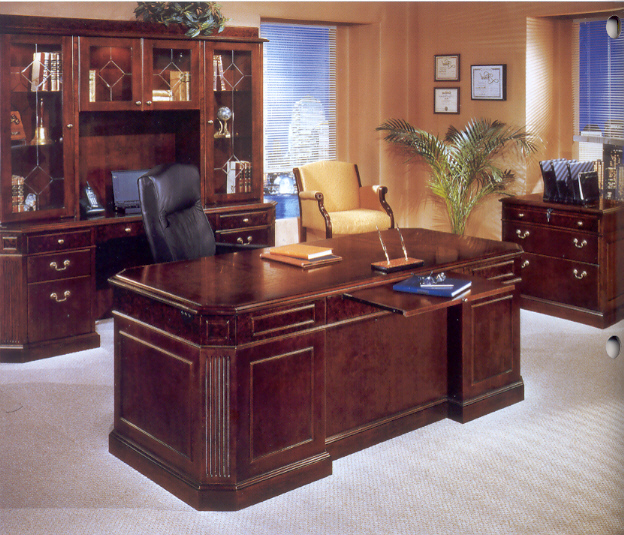 All desks, credenzas, and file cabinets have adjustable levelers. Cable grommets or other openings are strategically located on specific items to facilitate neat and easy cable management. DMI Office Furniture is currently on sale, 50% Off list prices in PDF. Free Shipping to a loading dock. (The freight company will get the cartons to the end of the trailer and then it is your responsibility to get the furniture off the truck). Residential delivery and Installation can also be arranged for an additional charge. Call 856-368-9085 for additional details. Take 50% Off the List Prices shown in PDF. Felt-lined center drawer with wood pencil tray; pull-out writing board/felt-lined box with wood pencil tray/box drawer per pedestal; file drawer accommodates letter or legal hanging file folders; kneehole locking pedestals; cable grommet in pedestal ends; pull-out dictation slide on center approach panel. Three, felt-lined drawers with pencil trays; two pull-out writing boards on working side; one pull-out writing board on approach. Center, felt-lined drawer with a pencil tray; 2-door cabinet with an adjustable shelf; pull-out writing board/felt-lined box with a pencil tray/box/file drawer per pedestal; locking pedestals via locks inside cabinet; file drawers accommodate letter or legal hanging files. Drop-front keyboard drawer; pull-out writing board; felt-lined box with pencil tray/box drawer/ file drawer per pedestal; fully extending file drawers accommodates letter or legal files; kneehole locking pedestals; cable grommet in back panel. Desks: Center, felt-lined drawer with pencil tray; pull-out writing board/felt lined box with pencil tray/box/file drawer; kneehole locking pedestal; end panel cable grommet. Returns: felt-lined box with pencil tray/box/file drawer; kneehole locking pedestal; cable grommet in top and approach panels. Two file drawers accommodate letter and/or legal sized files; central locking; equipped with an anti-tip device. Center, 2-door cabinets with canister light; left and right tower cabinets, each with two, glass adjustable shelves, canister light 31.75" width between tower cabinets; 24" vertical clearance; cable grommet in back panel. Center, 2-door cabinet; left and right tower cabinets, each with two adjustable shelves, 31.75" width between tower cabinets; 25" vertical clearance to bottom of center cabinet; cable grommet in back panel. Two-door cabinet with two shelves; canister light; includes felt pads and back mounting hardware. Two adjustable shelves; adjustable glides. Three adjustable/removable shelves; metal hanger rod; Euro style door hinges. Fluted corners on a 20" wide base; top features madrone burl veneer top with a cherry veneer border.